Digit-Eyes stores up to 1,000 hours of content on most phones, so the labels can be used for items in long-term storage. Ana is a mad knitter. She is making the challenging Lion Brand tumbling blocks afghan that uses 15 different colors of yarn. She wants to be able to easily tell the yarns apart while she is working, and she wants to be able to store the leftover yarn and know what it is when she next goes to use it. How to know what is what? 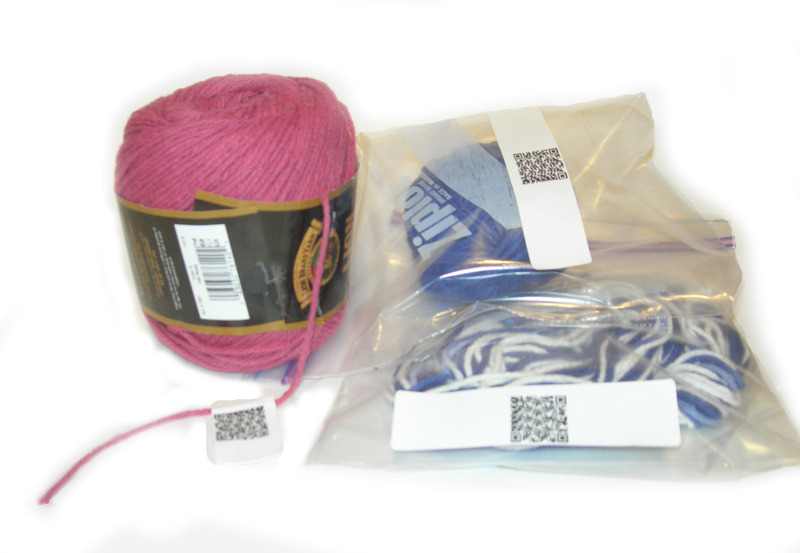 When Ana gets the 20 skeins of yarn in 15 colors that are required to make the piece, Ana takes a sheet of printed labels from the kitchen where she normally keeps them, peels off a label, and puts the label on the outside of the each of the Zip-Lock bags that she uses to hold her yarn while knitting. She has one yarn that she knows she will use up, so she just folds the label over the tail of the yarn that will be the last piece used. 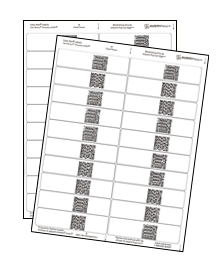 Ana brings up Digit-Eyes on her phone and scans for the UPC code. Digit-Eyes accesses the Internet and tells Ana that she is holding a skein of Vanna's Choice yarn, and the color is sapphire; Ana reads the pattern and finds out that Sapphire is called "color D" throughout the pattern. Ana records that the color is sapphire and it is color "D" in the tumbling blocks afghan pattern. Digit-Eyes stores this recording on her phone. Ana does this for each of the 20 balls, and she is ready to knit. When she is working and comes to a color change in the pattern, she can easily identify which ball is color D (or A or J, etc.) by scanning her label and letting Digit-Eyes tell her which color the yarn is. When Ana is done with the project, she has little bits of various yarns left. Since she keeps her yarn in Zip-Lock bags while knitting, all she has to do is to put the Zip-Locks that contain the remaining yarn in her stash. Ana does NOT delete the label content from her phone because she is not finished with the label. When she gets around to making hats in the fall, she just has to scan the labels on the bags and she will know what color is in the bag and what it was used for because Digit-Eyes will tell her "Sapphire Vanna's Choice, Color D, Lion Brand Tumbling blocks afghan". She'll be able to pull out the colors she wants and make hats for gifts, comfortable that she knows the colors she is working with, and Digit-Eyes has done its job.